With a growing consumer demand for healthy, natural, and sustainable products, it’s no wonder Hormel Natural Choice meats is one of Hormel Foods fastest growing brands. 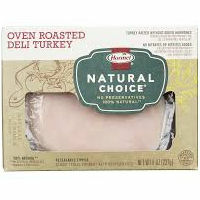 Hormel Natural Choice products are 100 percent natural with zero preservatives and no artificial colors or MSG. No nitrites or nitrates added, and they have no gluten-containing ingredients.